Learn how to paint furniture with this detailed tutorial, which includes great tips for getting a smooth finish! 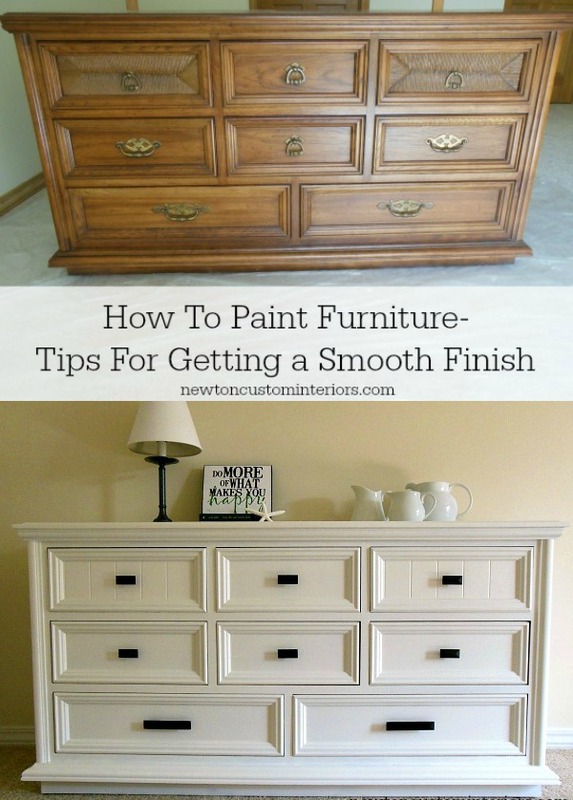 Update your old furniture by painting it! I’m very happy with how this dresser turned, but honestly, it only turned out OK because of much trial and error on my part. I made a few mistakes on some other painting projects, and learned some painting do’s and don’ts along the way. So, in this post I’ll try to help you skip all of the problems and mistakes, and go straight to having a painting project that you’re thrilled with too! I’m afraid there aren’t any shortcuts, or quick fixes that I can share from this painting project. I had a lot of water damage on the top of this dresser, so it needed a lot of prep work ahead of the painting, The prep work is so important to get a nice finish. Believe me, if I could have used any shortcuts I would have! Let’s take another look at the dresser before it’s makeover. It’s a good, solid (heavy) dresser that just needed some TLC and updating. Benjamin Moore Advance paint – A latex paint in Benjamin Moore’s color White. This paint is awesome when you want a very smooth finish. It has a slow dry time, so it levels out very nicely. Wooster roller – This roller is fabulous! The smooth finish it gives is almost as good as the finish you get from spray painting. Zinsser Allprime Oil-Base Sealer and Stain Blocker. This is a good oil primer to cover the wood stain and varnish. 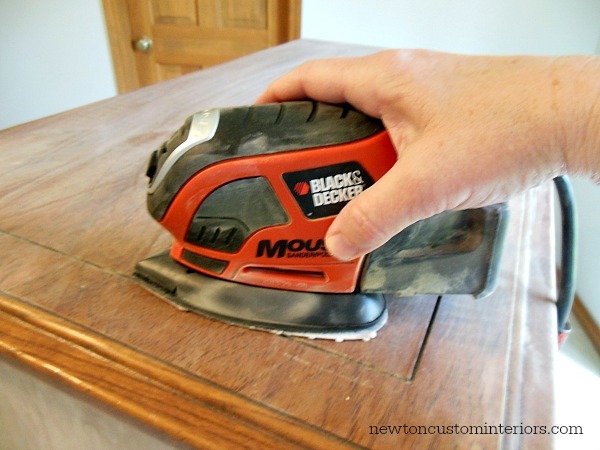 Black and Decker Mouse Detail Sander – This was great for sanding the flat parts of wood. It has a narrow tip at the top that helped to get in the corners of the drawer fronts. Sandpaper – I used regular sandpaper on the curved parts of wood that the Mouse Sander could not get to. Tack cloth – To clean off sawdust from sanding. TSP Substitute – This is a liquid form of TSP. Paint Sanding Respirator – I wear this mask whenever I’m sanding my projects. Polycrylic Protective Finish – I applied the polycrylic to the top of the dresser to help protect it from scuff marks. 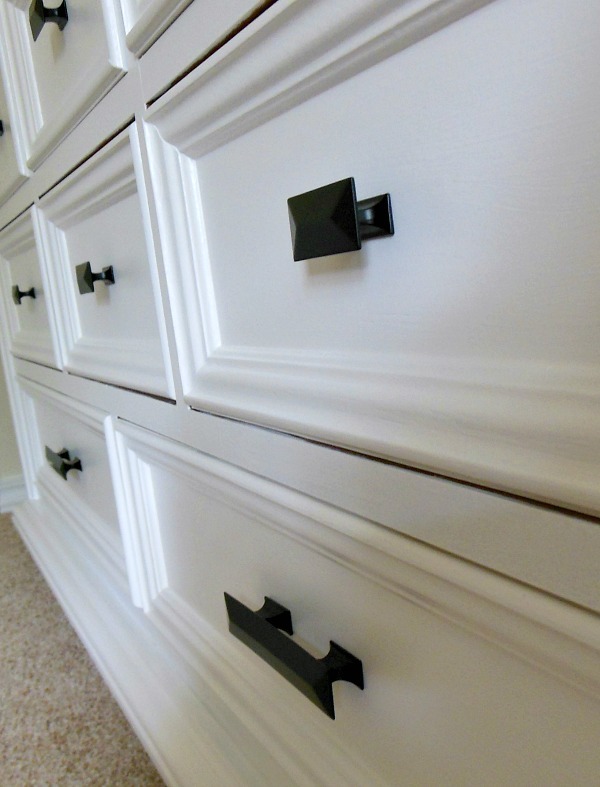 Hickory Hardware drawer pulls and Hickory Hardware knobs – I love the hardware I bought for the dresser! They really update the look! I’ve created a video showing the steps that I took to prep and paint the dresser, and I’ve also listed the steps below the video. The first thing I did was take off all of the hardware. I also took the fake wicker inserts out of the two top drawers at this point. I washed all of the drawers and the dresser with a liquid TSP Substitute. (Follow the directions carefully). This is probably one of the most important steps to prepping the furniture. Use the liquid TSP substitute. I used the powdered real TSP on another painting project, but did not rinse it very well. The paint started chipping off very quickly after I had finished the project. When I asked my local paint store guy what I did wrong, he said that probably I didn’t rinse the TSP well enough. He said that a lot of people mess up this step, and he recommends using liquid TSP substitute instead. The liquid TSP Substitute does not have to be rinsed off, but I did rinse anyway. This step is important because you don’t want leave any oils on the wood, or your paint won’t stick as well. 3. Fill holes from drawer hardware, and any other imperfections in the wood. I filled all of the holes in the drawers from the hardware with a good wood filler, and let it dry. To get a smooth finish, and to give the primer and paint something to grab onto, you need to sand all of the wood. I used a 100 grit and then finished with a 240 grit for the water damaged top of the dresser. If you are starting with a fairly smooth undamaged finish, the the 220 grit will work fine. Make sure to sand the same direction as the grain in the wood. Do not use a circular motion or go against the grain of the wood. This will cause the wood to scratch. For the flat parts of wood, I was able to use my Black and Decker Mouse Detail Sander. It worked great for getting into the corners, and like I said the flat parts of wood. Especially the top that was water damaged. For the curvier wood parts, I did have to sand by hand with sandpaper. 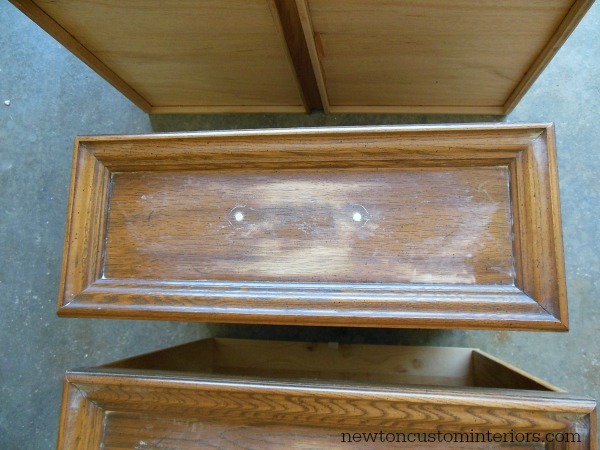 Here’s a picture of one of the drawers after the holes were filled and sanded. 5. 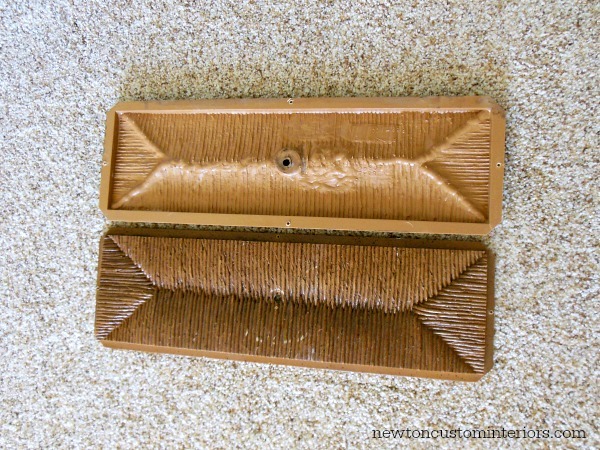 Wipe down the wood with a tack cloth. Make sure to wipe all of the sanded wood with a tack cloth to clean the dust from sanding off of the wood. *At this point I inserted my new drawer inserts, using up some leftover pieces of V-board from another reno project. 6. Prime the wood with an oil primer. Using the paintbrush, prime all of the wood. I found that using the paintbrush instead of the foam roller worked better when trying to apply the oil-primer. The primer went on smoother. Let the primer dry the recommended amount of time that it says on the can. I let mine dry overnight. 7. Sand all primed wood. I know, I know, sanding again? This was key to getting a smooth finish. After the primer was dry, I had to sand all of the oil primed surfaces with the 220 grit sandpaper before applying the Advance regular paint. Otherwise, I could see every brush stroke from applying the primer. 8. 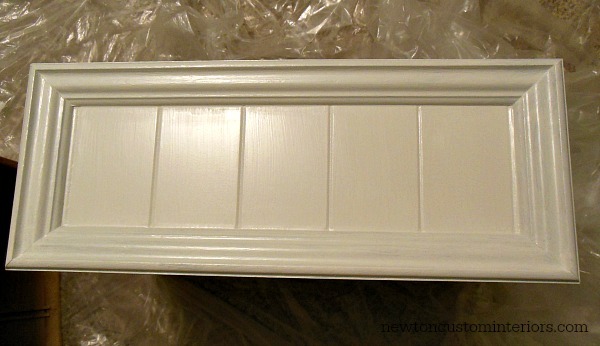 Apply the paint ( I used Benjamin Moore’s Advance paint in a satin finish – color White). Apply the paint using the Wooster foam rollers where possible. For the top of the dresser this was especially important. The roller gave me a very nice, smooth finish. For the curved parts of wood, I needed to use the Wooster paintbrush instead. Let the paint dry the recommended amount of time before re-coating. For the Advance paint I was using, it was recommending to wait 16 hours before applying the second coat. I let mine dry overnight. 9. Apply a second coat of paint. Follow the instructions in step 8 to apply the second coat of paint. The Advance paint is very thick, so I only needed 2 coats. If you’re using a thinner paint, you may have to apply another coat. 10. Install new drawer hardware. I couldn’t wait for this step! Installing the new drawer hardware really updated the dresser. 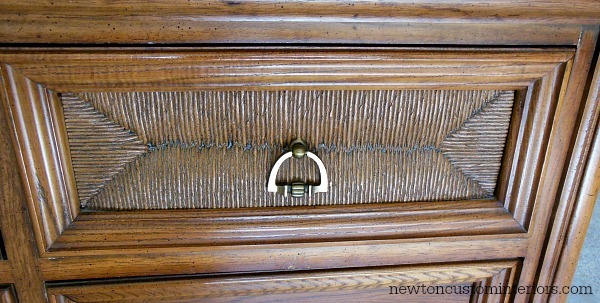 For this dresser I chose this Hickory Hardware knob and Hickory Hardware drawer pull. Make sure to let your paint dry a couple of days before installing the hardware. 11. 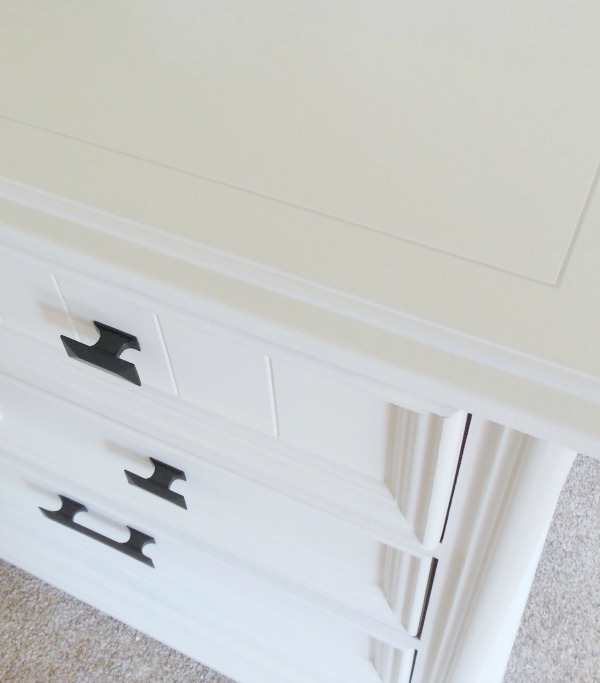 For extra protection, apply 2-3 coats of a polycrylic protective finish to the top of the dresser. After a few months of daily use we were getting some black scuff marks on the top of the dresser. To help protect the white paint, I applied 2 coats of a Polycrylic Protective Finish made by Minwax to the top of the dresser. I did not use the polycrylic on the whole dresser, but you could if you wanted too. It took some hard work, but now we have a nice smooth painted finish! I’m thrilled with the updated look of our dresser! Let’s look at the before and after again. I hope you’ve enjoyed my how to paint furniture tutorial! If you’ve updated a tired and worn out piece of furniture with paint, please share pictures with us. I would love to see your finished projects! Thank you so much for sharing these great tips! I’m going to pin! Should I seal it once I’m finished painting? Kayla, I did not seal this dresser, but you certainly could if you want to. I am going to be researching how to seal a couple of white painted tables soon. They’re going to get a lot more use than this dresser, so I want to protect them. I’m going to try to find a polyurethane that does not yellow to seal the white paint. It’s amazing what a little elbow grease can accomplish. The dresser really came out beautiful! We have a lot of tired looking furniture around here that could use some tlc. Thanks for sharing your helpful painting tips. Now I just need to muster up a little motivation. Thanks Nicole! Yes, it took some work, but I’m thrilled with how it turned out. Motivation for a projects can be hard to come by some days! Thanks so much for sharing these tips! I have a dresser that needs refinishing too, and same thing – water damage on top. I’m pinning this and coming back to it when it comes time to tackle this. Thanks Sylvie, good luck with your project! This turned out amazing! I am always afraid to try big projects like this, mostly because of the lack of extra space we would need. No garage and urban living don’t leave much room for large projects. Thanks Sarah! Yes, it’s definitely hard to do this kind of project if you don’t have a lot of space. Thanks Elaina! (By the way, I like your last name!) Sometimes it’s hit or miss when you’re looking for a certain kind of piece. Good luck! Thanks Clare! Yes, it might be a good idea to wait awhile! This is so helpful! 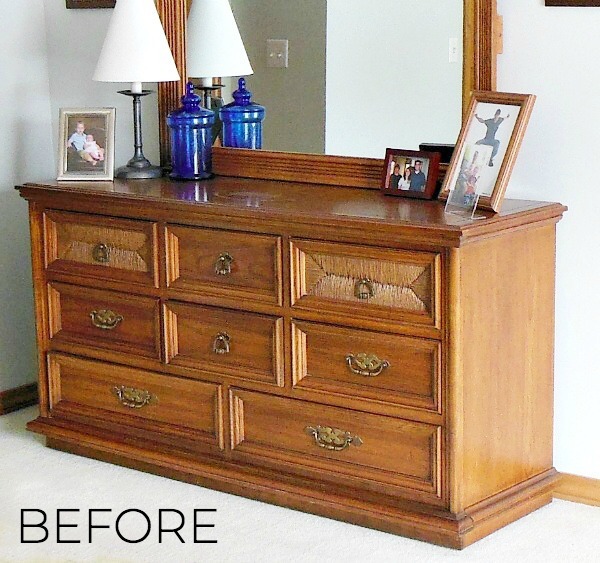 I have a super old dresser that looks very similar to your before picture! Jill, I’m glad it was helpful! You’ll have to give it a try on your dresser. What a great tutorial! I recently repainted an old desk for my office. I wish I had known about the TSP substitute … might’ve saved me a few coats of primer! Keeping your directions pinned for future projects. You did a great job with the dresser. Replacing the fake wicker was a good choice and I love the hardware! Thanks Lani! Yes, who knew the TSP was so tricky? Looks Great – Love how you replaced the wicker fronts and updated the look. Next time you might want to try Annie Sloan Chalk Paint and you won’t have to sanding. It is super fast and easy and takes 1/2 the time. I’m usually done with a project same day as starting. These are really good tips. I have a dresser in my little boys room that was a hand me down and I really want to update it. Thanks for the info! Thanks Jessie! Good luck with your dresser. What day and time is the roundup? I’d love to link up to it! That looks beautiful! 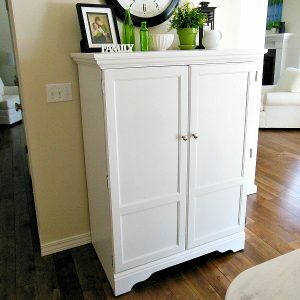 My painted furniture never comes out well, so I am bookmarking your tips! Thanks for the post! I just painted my bedroom and bathroom and I am apparently addicted. I want to paint everything. One thing I was wondering, I see a lot of clear coats in the paint aisle and I wonder which pieces would need this? Any suggestions? Gwen, it can get addicting to paint furniture! I’m going to be researching clear coats next spring when I paint my dining area table. I’m thinking I’ll want something that will help protect the paint on the top of the table since it gets hard use. I’m hoping to find something that will not yellow over time. Let me know if you come up with something for your projects! I use hellmans quick dry polyurethane in satin for all my pieces. Sometimes I do a satin on the bulk of the furniture with a semi gloss on the top flat piece. Poly takes some practice but I find it’s the most durable for pieces with heavy use. 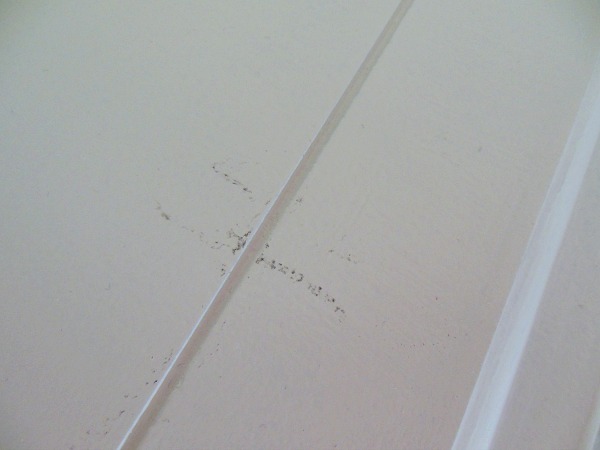 Darbi, does this product yellow over time if top-coating a white paint? I think I have read over my time reseaching painting furniture. I thought if you use oil primer paint too should be oil then poly for that type of paint. I have read that Kiltz, latex with an additive which kinda gives the latex a oil base effect with slow dry and keveling. The yellowing is being caused by type oprimer and paint. Layex should take a wayer based poly w/o the yellowing. The discoloration also can be type of wood. So natural oils will show if in correct sand and primer. A person once said kilz was only primer used, not an oil one either then two very thin coats the paint with a premium latax paint not with a primer in it, but add the Floratol additive as per instructions and then paint first coat and to my understanding it wont look great but dont panic additive dries weird, but 24 hrs second coat with additive. You apply primer, sand lighly, then paint, check 10 mins to catch drips because paint in upright postion can show drips. Then sand area very lightly if you want akslways wipe clean. Paint second then 24 hrs seal with method of choice. This goes for chalk paint even though it says no sanding and priming. Yes, sand, prine paint. With chalk additive is not used. Home depot has it in store along with a chalk paint that works great by Amercan Decor. They now have a home decore paint sprayer air compresdor included for small to medium project designed for chalk pait, latex, oul and sealers. Some may need thinning but just ask. It cleans easy and it is rated very high and only about $70 to under $80 dollars. I love Pinterst for great paint tutorials from fabric, walls, trim, furniture and even paint boards on latest colors. I know this post is old, but the main point of comment is the additive. It is very, very popular for DIYers. So do some reading on a simple piece you want to try and go for it. Live, Love, DIY is great blog. Laminate painting too, steps are different. No sanding first. I am in the process of doing a large dresser very similar to the one you have done. I love the color you have chosen and the hardware. Would you mind sharing the color you used and the place you got your hardware from? Thanks! Hi Cheri, the color of the Benjamin Moore Advance Paint is called White. Yep, that’s the paint name – just plain old White. I ordered the hardware through Menards. Thank you so much. I just love you piece! Can’t wait until mine is finished. Is there any tint or just the Benjamin Moore off the shelf?? Thank you for the wonderful tutorial. I am doing my daughter’s bedroom furniture this weekend. Jodie, there is a tint in it. But, the name is just WHITE. Thanks! Good luck with your project! I’ve been scared to try painting a piece of furniture, but your dresser turned out so gorgeous that I want to try an old bar cart I have. I’d love if you linked up at Inspire Us Thursday on Organized 31. Susan, I’m sure you will do a great job on your bar cart. There’s nothing so satisfying as how a few coats of can change the look of furniture. Thanks Jan! I did not use a clear coat to protect it, planning on doing that when I paint my dining area table next spring. It’s a cleaner that you use to get oils off of something before painting. You can find it at Menards, Lowes and Home Depot. Great piece! I cannot believe how gorgeous it is after the painting, a piece to be proud of. Loved how detailed and step by step your article is, thanks for sharing all your hard work and learned knowledge. Now…to find a great old ugly dresser to jazz up! Thanks! Wow, that turned out great! 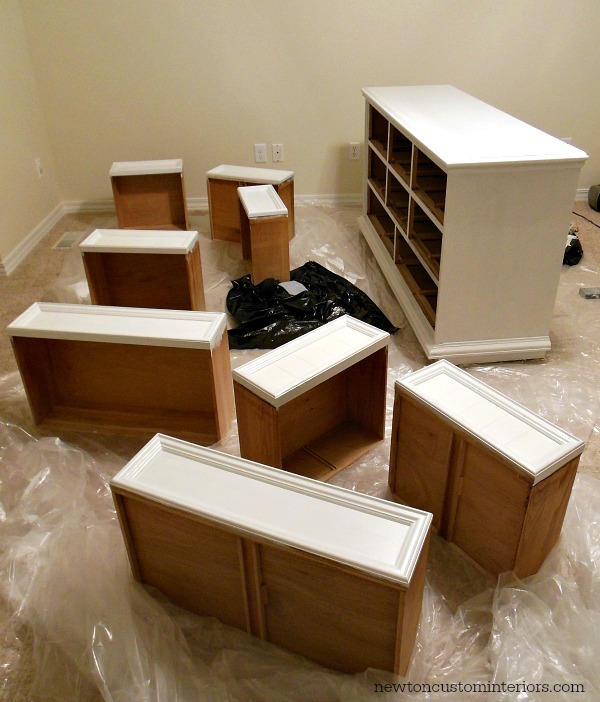 My painted furniture projects have been less than stellar, so I am thankful for the tips! This is such a GREAT tutorial – pinned for later already and this will surely become a great resource for me! Great post, it turned out great, I will have to pin this because I have a couple of dressers & other pieces I must try this on in the spring, must share with my fans too. Thanks Cheree! I would love to see your finished projects! I have some furniture that needs to be redone. This is a great idea, I might have to give this a try. Great Job on the dresser, it’s beautiful. Thanks Teresa! Give it a try, there’s nothing as satisfying as painting! That’s absolutely gorgeous! We have a couple of outdated pieces that definitely need to be spruced up. Thanks so much for the tips! Thanks Brandi! Paint is wonderful for updating furniture. Wow! So beautiful. Great job. Super useful! Expecting baby number 2 and we were just talking about dressers. I may just have to use your suggestions. Thanks! Thanks Annie! Congrats on baby #2! Great tutorial! I’m planning on redoing my mismatched bedroom furniture and have never done it before. Thanks for sharing your tips – I’m sure it will save me a lot of oops! Thanks Savanah! That’s why I did this tutorial, so that maybe others wouldn’t have to go through the trial and errors that I did. Good luck on your project! Such a great tutorial! I have been looking for tips on painting a table but was a little nervous on how to start! Will need to pin! Thanks Ana! Good luck on your project. I am getting ready to redo a China cabinet so these tips will come in handy. Love refinishing old pieces to give them new life. Good luck on your china cabinet, Melissa! I have updated several pieces of solid wood furniture and I find that if using a water based latex paint, thinning it considerably with water and doing several coats give me the finest finish.but I also sand every inch with a three step process….80 grit then 120 then 220. Also sanding very lightly with 220 between each coat of paint and poly. Thanks for the tips Darbi! I have mismatched dressers in my bedroom. This is really helpful. I need to show my husband so maybe we can put your ideas to work after the holidays. Thanks Tara! This would be the perfect solution to mismatched dressers! Hi Jann and all! Happy New Year, 2015! Jann, I’m house-sitting in Florida right now but will head home to ultra-rural, north-central North Dakota in mid-February. This tutorial arms me with the motivation, determination and confidence to tackle some long overdue furniture updating in our 115+ year old farmhouse. ALL of the woodwork in the house will be added to my To-Do slate because all of it is the original oak with layer up on layer of shellac that the oak grain ‘grabbed’ over the years. Besides this will give me a reason to combat Cabin Fever until Spring. Many thanks for the great post, Jann. I’ll be combing your ‘2014-Year in Review’ for further ideas besides furniture refinishing. Thanks Robin! I’m so glad you enjoyed the tutorial. It sounds like you definitely won’t have to worry about cabin fever! I have painted most of our woodwork this year too. I’ll be posting about that soon. I’ts a huge job, but I absolutely love the results! This is a beautiful piece of furniture! I have a question, did you use the Tack Cloth after you did the “second” sandpapering? Thanks Sandy! Yes, after each sanding I used a tack cloth. what an xcellent article! Lots of helpful tips. And that piece came out beautifully. One minor clarification I think bears mentioning is the use of putty vs filler. And forgive me if I missed it somewhere. Technically putty is not supposed to be used underneath a finish. If you are filling holes or making wood repairs that you intend to finish or paint over it is wise to use a filler. Filler is made to harden so that it can be sanded and stained or painted. Most wood putties on the market do not harden and are intended for use over top of your finish to fill blemishes after finishing. The manufacturer’s instructions for wood putty will often state this specifically on the label. Wood filler which is made to fill blemishes under a finish will specifically say on the label that it is sandable and stainable. For those who are home refinishing or painting furniture for the first time, knowing this distinction may come in handy. Thanks Dan! Yes, it was wood filler that I used – not wood putty. I have changed that info in the post. Thanks for catching it! I am using your method and am finished with primer and almost ready to sand again … the only problem I have is my dresser drawers don’t come out … that little detail is making it pretty hard!!! Oh Jessica, I’m sorry to hear about your drawers! That would really make it harder. Good luck! I just refinished a curio cabinet and am thrilled with the end product. I’m now preparing to refinish a sideboard, large dining room hutch, and eventually a grandfather clock. Your tutorial was the best I’ve seen for tackling these projects. Thanks so much for the detailed explanations and pics! Thanks Susan! I’m so glad the tutorial was helpful. Good luck on all of your projects! Wow! Great ideas! Brilliant! It turned out great, I’m glad that I found these ideas in pinterest. Thanks for the inspirations. Thanks Julieane! I’m glad the tutorial was helpful! Quick question? Does the oil base primer and paint work better on wood furniture? I went to my local hardware store yesterday and purchased the zinsser water based primer and today purchased a valspar water based paint. I still have to apply another coat of paint but it is just not coming out quite as nice as the dresser you have posted. I was just wondering if it is because I decided to go with water based primer/paint vs oil primer/paint. Any feedback would be appreciated to help with future projects! Adreinne, yes, you probably need an oil based primer. The primer I used was recommended to me by the paint store. Great tips! I am working on a dresser for my daughters’ room, and I will definitely use this when its time to paint! Thanks Rachel! Good Luck with your dresser! Thanks so much for sharing! I have two tables in my craft room that I’d love to paint but I’ve put it off because I wasn’t confident I could get a smooth finish. Your tips will be a big help? There’s a lot of steps to repaint your wooden furniture, but it’s best to do it well the first time than have to fix it later! I’m glad you pointed out to sand with the grain, not in circles, because I’ve made that mistake in the past and it did not turn out well. This is a great way to give a piece of furniture a great custom color and feel. Thanks for the article! Thanks Hazel! Yes, it’s a lot of steps! Sanding is so important, and going against the grain of the wood can really affect the final outcome. I agree that you should sand via electric means. It gets the job done much faster, and it leaves your hand less sore. It also makes for a much smoother surface top. Yes, Elden, an electric sander is the way to go, especially for a large project. It’s definitely good to know. Thanks for the post and the reply. Thank you for the great detailed steps! 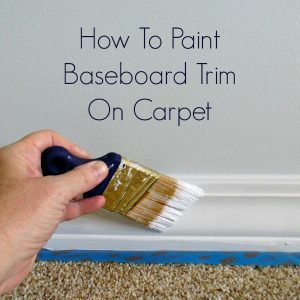 I am new to painting furniture and this is so helpful! I noticed you used an oil based primer. Was your paint also oil based? I couldn’t tell by the picture. In your opinion, is oil based better for furniture? I’ve never used oil based before so a little nervous lol. Ashley, you’re welcome! I just added to the post that the Advance Benjamin Moore paint is a latex paint. I don’t use oil-based paints because they can yellow over time. You do want to use an oil-based primer. It’s amazing. Great information. I will pin this right away in case I ever need step-by-step instructions on how to paint furniture. Thanks for sharing this. Beautiful work, Jann ! Thanks for sharing your learnings. I really love the new hardware – where did you purchase it? . Thanks Connie! You can click on the affiliate links in step #10 to purchase the hardware. Thanks Jessica! I’m glad this post was helpful! Beautiful !! Appreciate your excellent detailed step by step instructions. 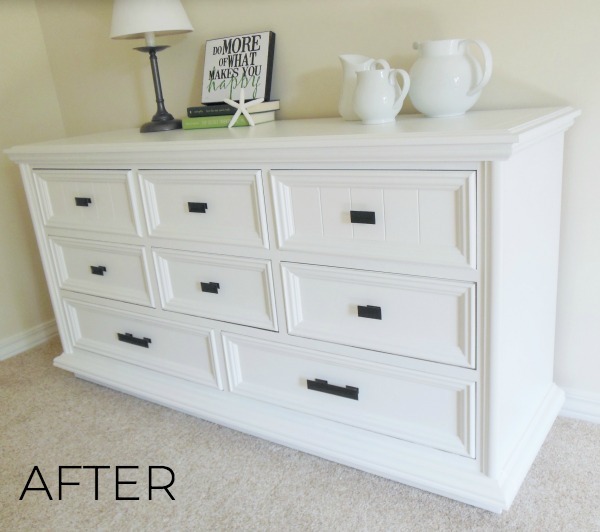 I have very similar furniture that I’d love to paint white like yours – Dresser, Chest and Night Stands. Did you find a polyurethane that does not yellow? Thanks Cathy! Please read step # 11 for poly tips. Kathy, I got my Zinsser All-Prime at a good paint store, not at a big box store. I don’t know anything about the primers that you mentioned. Hi! I saw in your post that you used polycrylic just for the top of your dresser to add more protection from wear and tear. Just wondering what you used to apply it? Did you use the foam roller or the paint brush? I LOVED your smooth finish and yould love that for my project as well! Teresiea, I applied the polycrylic with the same Wooster paint brush listed above. Thanks for the tips! Every time I paint furniture it remains tacky for weeks! I am really intimidated by the idea of tackling another piece. Do you know why I run into this problem? Is it the quality of paint I’m using? Thanks!! If the piece I’m painting already was painted, do I have to prime it? If the piece is painted with an oil paint, then it may need to be painted first with an oil based primer. Otherwise the new paint (if it’s a latex) won’t stick. If the piece is painted with a latex paint, you can probably just lightly sand and then paint. If you use and oil based primer, can you use a latex paint? Jody, yes, if you use an oil-based primer, you CAN use a latex paint. A great tutorial for people to follow!! On my dresser I used some stripper before I sanded to make sure any previous coatings were removed. I think it can help anyone who does not want to spend hours sanding off polycrylic! Thanks Ariana! I’ve also started using a deglosser when I can open the windows or paint in the garage. It save the two steps of washing with TSP and sanding. I’m so excited to start my projects. Thanks for the cool tips. I hope my dresser comes out half as great as yours did. Gabrielle, Good luck with your projects! Wow, it’s beautiful! I love mainly wood and rustic furniture, I loved your blog. Wow, The Dresser turn out wonderful. I have the exact dresser, it was my grandfathers. Would love to change it up a bit. Thanks for explaining everything perfectly. Thanks Denise! Good luck with your project! That’s so funny that you have the same dresser! Julie, it’s Benjamin Moore’s White. What a great transformation! Your post is so inspiring, that I want to get my paint and projects out for the spring! Great post! Thanks Janine! We love how the bedroom furniture turned out! Thanks for all the great info! I am excited to try this on a buffet table I have. Thanks Lacey! Good luck with your buffet table! Just this summer I’ve tackled my first couple of furniture painting projects. After watching your video , and reading your instructions, I’m feeling pretty good about what I did! My projects turned out nice but I wasn’t sure about long term durability and now I feel like I did it right 🙂 as I followed all the same steps that you suggested! But I do have a question! I did one thing differently and that was using regular Kilz 2 primer (not oil-based primer. Could you explain the difference between the primers and why oil-based is the one to use? I used the Kilz 2 because I had almost a gallon of it handy but I’m sure hoping that long term my projects will last! Thank you so much for any advice. OH, if you’ve already answered this question, I apologize. I read several but not all of the prior comments and questions so I may have missed it! Thx again! I was told at my local paint store that it’s always a good idea to used a good oil-based primer to help the stained wood not bleed through. That’s why I recommend using an oil-based primer. I didn’t want to do all of the work of painting the stained oak furniture and have bleeding of the stained oak through the paint. Is the paint you used latex or oil based? Curious since you used an oil-based primer… What brand of poly did you find that doesn’t yellow the bright white? The dresser looks beautiful! I used an oil primer to cover the stained oak wood. I used the latex paint that I talk about in the post. I also talk about what kind of polycrylic I used in the post in step 11. It is such a beautiful piece you created. I’m gonna follow your instructions to paint some of my bedroom furnitures. One question is what kind of finish did you use for the paint? High-gloss? Satin? I used a satin finish, and I added that info to step #8 in the tutorial. Thanks! I absolutely love your style! I am in the middle of painting a dresser and you’ve inspired me to finish it, haha. Thanks Courtney! Good luck with your project! This looks great, and you used my favorite brush. Love the Wooster Shortcut brush. It was so refreshing to see someone use oil-based primer before painting. I’m a firm believer in it on wood or anything that paint may have a hard time adhering to.. Now days people are using the latex primer before the top coat, and I just don’t think it will get the proper adhesion. Have had to argue with some so-called painters about it beforemand just decided to do my own projects if they argued too much about it. If people can get it to work for them that’s great, but I used work in the paint department for 6 years at Lowe’s many years ago, and that’s even what the paint reps recommended. Oil primer is what I always use. Anyways, also nice to see a latex top coat instead of chalk paint. Nice job!!! Thanks for the kind words Kendra! Thank you so much for sharing!!! This was amazing, and I have started this project. I wanted to ask if the Minwax yellowed over time? I’m so glad this tutorial was helpful! No, if you use the polycrylic, NOT POLYURETHANE, it will not yellow. For the polycrylic you did use, I notice that there are several types, such as clear gloss, clear semi gloss, clear matte and clear satin. Was there a specific type you did use in this tutorial? I used the MinWax Polycrylic in satin. hi jann, my compliments on the dresser and kitchen cabinet video tutorials! they are both so calming and thorough. no background noise or useless chatter. lovely! 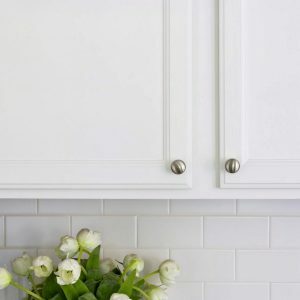 what is the difference between the benjamin moore (dresser) and the ppg (kitchen cabinets) white paints and why do you use each? i’m not sure how or if i’ll see a reply but i’ll try. i’m looking around for how to subscribe to your blog! thank you! Hi Marsha, great questions! When I first started painting our dressers, the Benjamin Moore Paint was recommended to me because it dries slow, and is self-leveling. But, you have to wait 16 hours between coats. My painter, who spray painted my kitchen cabinet doors, thought the Ben Moore paint was too thick to use in his spray painter, so he recommended I start using the Pittsburgh Paints Breakthrough paint. It is thinner and dries quickly. It also gives a nice smooth durable finish. 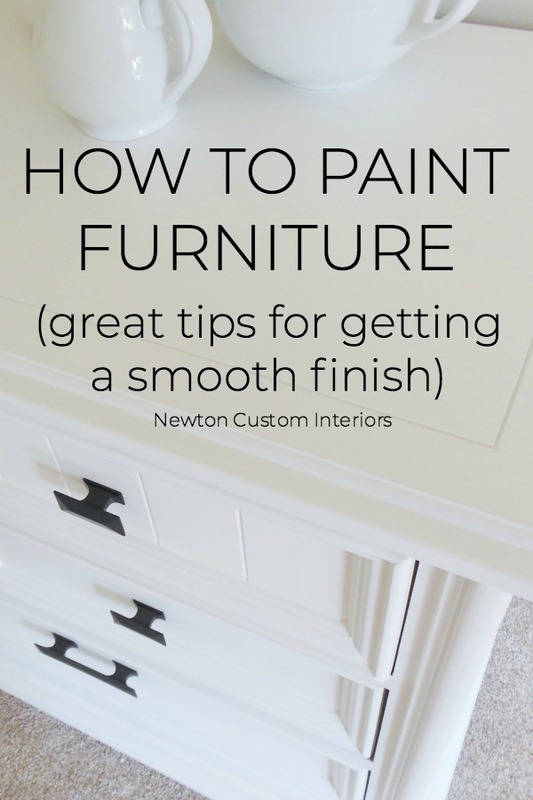 I have done an updated version of how to paint wood furniture using the Breakthrough paint – https://www.newtoncustominteriors.com/how-to-paint-wood-furniture/ If you would like to subscribe to my blog, there’s a picture in each post for how to choose paint colors. That will take you to an opt-in form to subscribe. Thanks! Hello! I’ve been following your instructions very closely for a dresser set refinish and I have a question-how long did you wait after your last coat of paint to apply the poly? The lady at BM told me 7-10 days but I’m not sure if that’s totally necessary? She didn’t seem to know the answers to a lot of my questions so I’m not sure if I really do need to wait that long. Candace, if you are using Pittsburgh Paint’s Breakthrough paint, then you can apply the polycrylic a few hours later. The Breakthrough paint dries fast. Awesome thank you! I’m using the Benjamin Moore advance paint. Is that the same process? The Benjamin Moore Advanced paint is not a quick drying paint. Sorry, I forgot that’s what I used for these dressers! You may want to wait a couple of days to apply the polycrylic. I applied my polycrylic a couple of months after I painted the dressers because I was getting scuff marks. I just looked it up, it looks like they recommend waiting at least 24 hours. I would wait a little longer since you’re using the Advanced paint, which is thicker and takes a lot longer to dry. Maybe even 48 hours. Great!! Thank you for the quick reply! My initial gut was saying 48 hours so I’ll plan on sticking with that! I didn’t know you could apply a poly so long after a paint job!